You are warned however that any resistance to lawful authority will be drastically dealt with. 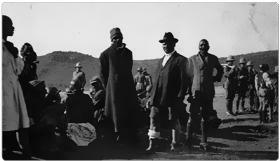 ENOCH MGIJIMA and ALL associated with him and styling themselves "ISRAELITES" at NTABELANGA. 1. To arrest certain men against whom warrants have been issued in order that they should be dealt with according to law. 2. To see that all unauthorized residents leave Ntabelanga and go back to where they came from. 3. To destroy all houses erected without authority. 4. On completion of these operations a Force will be left on Ntabelanga to prevent any unauthorised resident squatting there. Every one's person and property will be respected.